the farmers almanac of ontario is predicting this winter to be the coldest most harrowing winter- it’s one redeeming quality will supposedly be a relatively low amount of precipitation. my silver lining in that repugnant information is the suede boot opportunity. 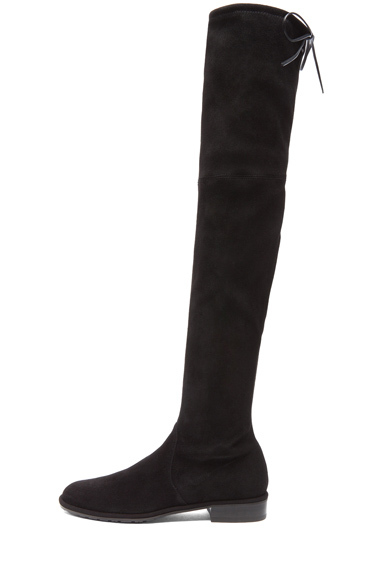 i’ve been licking my chops at the view of gisele in these over the knee suede stuart boots since the start of summer. just yesterday i caved and pulled them slowly up my leg, each inch more perfect than the next. i’m not sure i’ve ever been so keen on a stuart weitzman shoe- does this mean i’m an adult in seek of comfortable arch support and functionality? or did he just blow the 50/50 boot out of the water and create a black beauty for all ages? regardless i picture them grounding my skinnies topped with a cozy sweater and peacoat- just adore them.